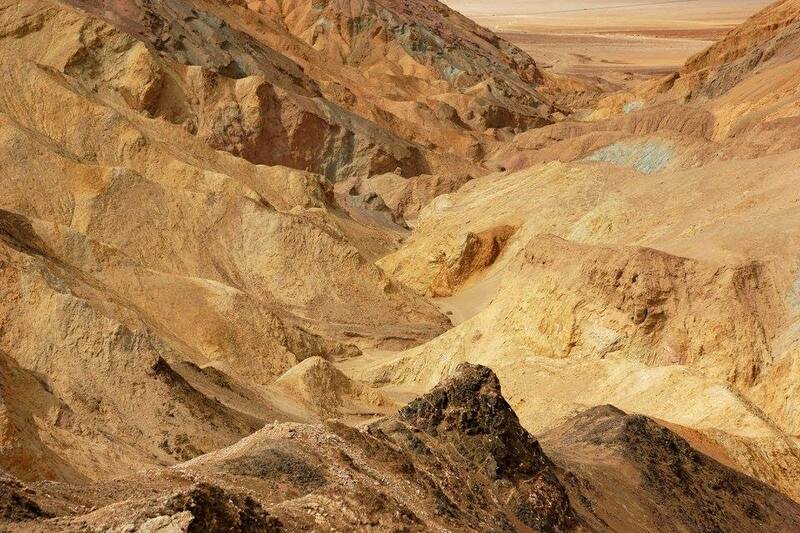 Desolation Canyon is one of Death Valley’s best-kept secrets. I don’t know why the park keeps it so hush-hush. But it doesn’t matter. I found it, and now you’ll know how to find it — and you’ll get to enjoy some crowd-free peace and quiet, even on the busiest days. 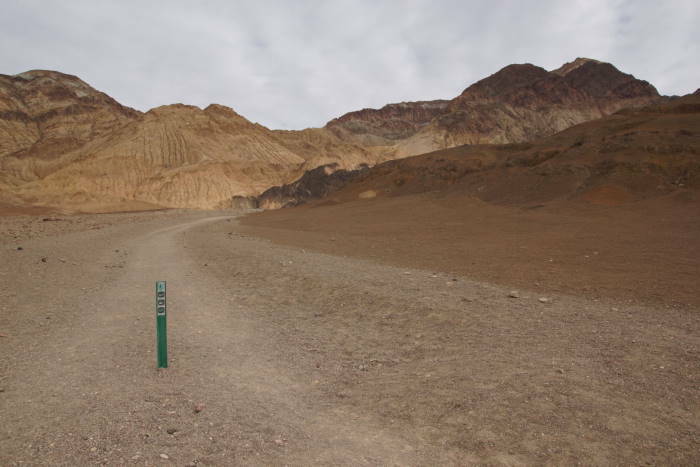 The trailhead for Desolation Canyon is unmarked on Death Valley’s official park map — and there are no signs at the dirt road that leads to the trailhead. You will find the unmarked dirt road south of the Golden Canyon parking area, and north of the one-way exit from Artists’ Drive. 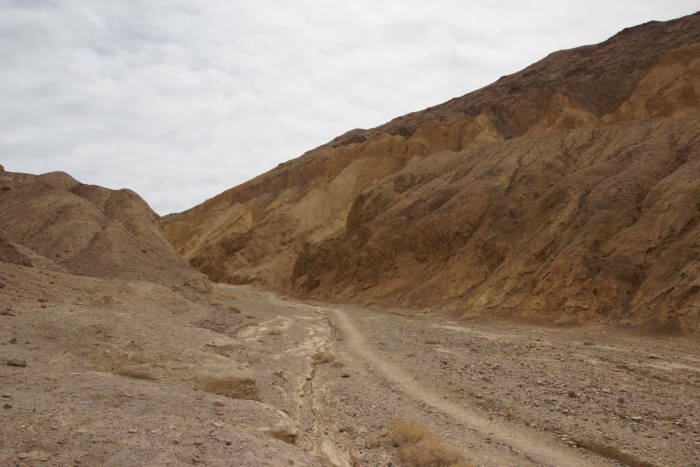 Desolation Canyon quickly became of my favorite Death Valley hikes, for a couple of reasons. Maybe it was because, after several days of hiking in Death Valley, I was growing tired of the Superbloom crowds, and I needed some solitude. Or maybe it was because I really didn’t know what to expect, which made every twist and turn more rewarding. You’d never find this trailhead if you were looking for a sign. That tiny green marker is the only indication that a trail begins here. When I arrived at the parking area, there were fewer than a half-dozen cars there — a remarkable difference from the overflowing Golden Canyon parking area, just up the road. … and takes you up a dry wash. There are several faint trails that all lead in the same direction. Pick one, and head towards the narrowing mouth of the canyon. It may look unimpressive at first, as you enter the canyon, but don’t worry, it gets better. The canyon tightens, and the jagged hills rise higher around you. That’s all very nice, but it still looks somewhat bland. So how about a splash of color? Obviously, there’s some interesting geology going on here. Bright shades of green and red pop out of the surrounding browns, creating a look similar to what you’d find at Artist’s Palette, just down the road. These spots are fun to photograph, but much more lies ahead! The trail passes through some narrow slots, as it steadily climbs. It might make you wonder, where exactly will you end up? 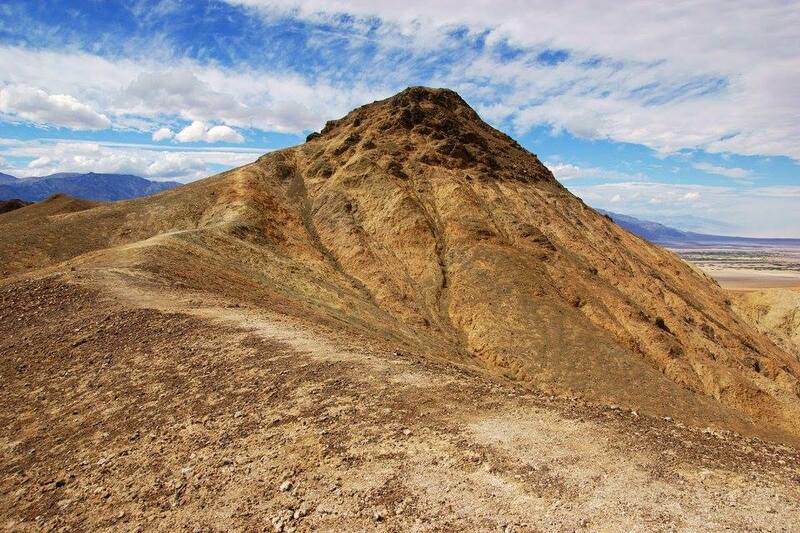 … to the top of a ridge that provides grand views up and down Death Valley. I should mention, on this day, I had experienced cloudy weather earlier, when I hiked the Mesquite Flats sand dunes at Stovepipe Wells. While some brilliant blue sky had appeared for my hike up Desolation Canyon, the wind had picked up. It was extremely breezy (as in tropical storm lean-into-the-wind breezy) on that ridge. But, I could look back towards the Mesquite Flats dunes and see a sandstorm had developed! It was much better to be here than there. The view to the south is also quite nice. In the distance you can see Badwater Road curving along the foothills of the valley. 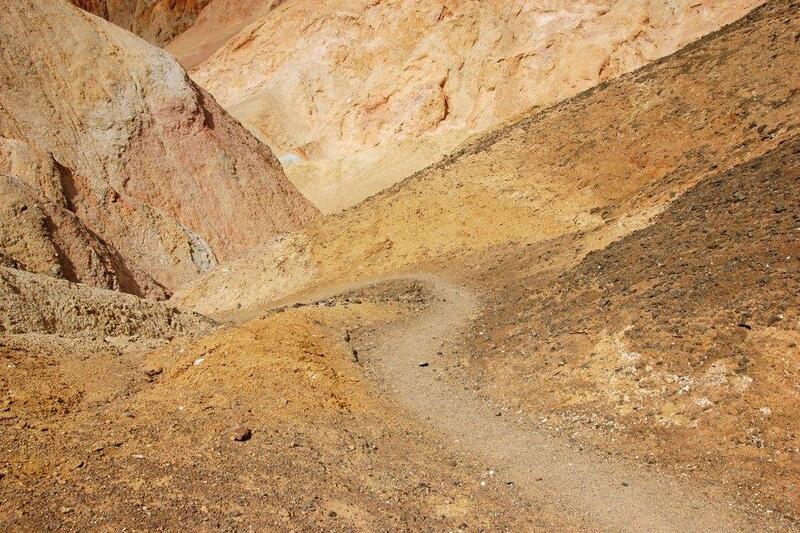 Look back down at Desolation Canyon to see the jumble of colorful hills that you just walked through! Once you’re satisfied with the view from the end of Desolation Canyon Trail, or if you’re just looking for an escape from the wind, head back downhill on the same trail you just climbed. You’ll backtrack all the way to the trailhead, hopefully enjoying a different perspective of the colorful canyon along the way. 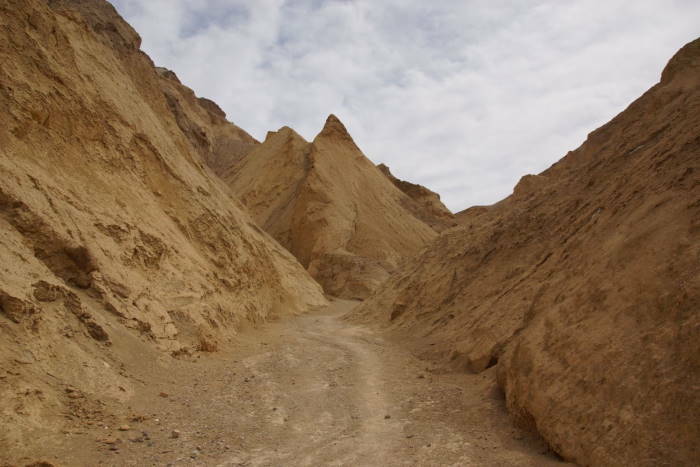 If you’ve hiked several of Death Valley’s more well-known trails, and you’re looking for some place different, you should definitely give Desolation Canyon a try. It’s not very difficult and it rewards you with a beautifully-colored canyon, and great views of the valley at the end.